In l933 Rowena went to Europe to study and spent a year on the continent immersing herself in painting and sculpture. She returned to a bustling, industrious city. Pittsburgh was the very heart of the steel industry and despite the depression that ravaged much of the country, chimneys belched, machines bellowed, business hummed. And there were new currents in the air. A decade earlier, American industry had begun to turn to specialists in the arts for help in designing and marketing products that would appeal to a growing audience of potential consumers. 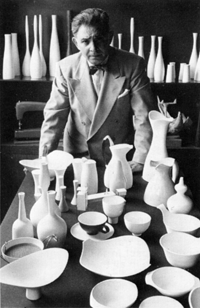 By the early 1930s a small cadre of designers had emerged: Walter Dorwin Teague, Raymond Loewy, Henry Dreyfuss, Donald Deskey, Gilbert Rohde, Norman Bel Geddes, John Vassos and Donald Dohner among them. These pioneers were staking out a new field, laying the groundwork for what would become the industrial design profession. Dohner’s experience convinced Kostellow that the opportunities in American industry were there for the taking. The time had come to formalize design training for a new design discipline. He had already spent years experimenting with ways to bring focus and order to art education, and gaining direct experience as a design consultant to several firms in the area. So he and Dohner went to the Carnegie Tech administration and proposed the establishment of a degree-granting program in industrial design. They successfully argued their case and in l936 the Department of Industrial Design, the first of its kind in the United States, graduated its first students. They were joined by Frederick Whiteman, Robert Kolli, Ivan Rigby and Rolph Fjelde, and soon after by Eva Zeisel and Victor Canzani. Their first big accomplishment was the development of a curriculum of study for all first year students in the Art School. It was called, appropriately, “Foundation” and was the first course of its kind specifically designed to address the requirements of the American art student and American society. It grew out of Kostellow’s own experiences with pictorial structure and organizing the axes on the canvas and Reed’s experiments with visual organization in three dimensions. It became the prototype for foundation programs in many other schools across the country. Three years after Kostellow and Dohner established the Industrial Design department at Carnegie Tech, the New Bauhaus opened in Chicago. Mies moved it to ITT in 1938, where it later became the Institute of Design within the Illinois Institute of Technology.) Directed by Laszlo Moholy-Nagy, it promoted the course of study established by Walter Gropius at the original Bauhaus. The Pratt and Bauhaus foundation programs were similar in some ways. ** Both approaches were rooted in common intellectual and artistic assumptions. Their methodologies drew on modern scientific method and applied it to teaching the fundamentals of art making. They identified elements such as line, shape, form, space and color and systematically investigated each one. Students were expected to have a thorough understanding of the parts before attempting a completed work of art or design. Both approaches shifted the focus on aesthetic development and teaching to the solving of aesthetic problems. The reason for arranging forms or shapes was taken out of the religious, metaphysical or moral sphere and placed squarely in the perceptual one. And both proposed that there could be more than one correct solution to a problem — in opposition to the classic academic notion — and that such solutions required the nurturing of personal inspiration and individual talent. In its practical agenda, the Bauhaus attempted to reconcile the aesthetic insights of the artist, the quality workmanship of the craftsman, and the technological advances of the machine. It declared that the artist should design in conjunction with the machine or for the machine. Although Kostellow’s program was not interested in the crafts, it shared the Bauhaus goal to educate designers for an industrial, machine-driven economy. This argument was key to Rowena Reed’s point of view. She was adamant about the primacy of the visual and aesthetic aspects of design. 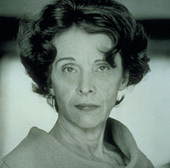 She defined aesthetic expression as the designer’s raison d’être. The Bauhaus approached the study of form from the perspective of architecture. Kostellow came at it from a different point of view. “Alexander Kostellow was aware of the Bauhaus early on when it was still engaged in diverse experiments and was very dynamic,” explains Craig Vogel. “The stuff was in the air before he left Europe. But he spoke a much wider avant garde language than the Bauhaus. He was dealing with spatial perspectives. The difference was that Alexander wanted to start a design program, Gropius wanted to start an architecture program and Mies (who succeeded Moholy Nagy at IIT) was even more reductive than Gropius. For him, everything flowed from architecture — and that was not what Alexander had in mind. “Alexander was closer to Peter Behrens, the father of corporate design. (Behrens, a German architect, designed several influential early modern buildings, including the AEG Turbine factory in Berlin in l909. He was one of the first to develop an architecture for industrial buildings based on function and structural character and the first artist to take on the whole range of corporate design, from identity to building fixtures). Behrens work was cut off by World War I, so he was probably not well known to Kostellow who left Europe at the start of the war. The debate about the relationship between industrial design education and architecture that heated up in the 1940s pitted the Gropius and Bauhaus-based camp, which supported the teaching of industrial design in schools of architecture, against design advocates who saw it more logically taught in schools of art. Donald Dohner defended the latter position for Pratt - and his argument won the day. Finally, unlike the Bauhaus, Kostellow approached the challenge of educating industrial designers as a social experiment. He saw art schools filled with talented, enthusiastic young people who needed to earn their livelihoods. And he knew there were few artists slated for greatness (or solvency) among them. It was a matter of supply and demand. Here was the talent — ready, willing and capable of being made able — and there was industry, turning out a steady stream of formally inept products. These young artists could help. They could make a difference in the quality of life for everyone and make a decent living in the bargain. He created a program to make it happen.